Mornings are exceptionally important to white people, as witnessed by their love of breakfast places. However, some white people never go out for breakfast on a Sunday Morning. The reason? The Sunday edition of the New York Times. A perfect white sunday generally works like this. Wake up at around 8:45, if the paper is delivered, then one walks to the front door, retrieves the paper and begins a pot of coffee. If the paper is not delivered, a white person will go out and usually buy the supplies needed for breakfast – bagels, orange juice, lox, cream cheese, or waffle mix. Some white people even pick up freshly brewed coffee with the paper! White couples usually fight over who gets to read the Sunday Magazine first. How do we know this? They will tell us repeatedly about how they always fight over the Sunday magazine. The secret you may not know, is that deep down, all white people are desperately trying to make their life seem like an ad for a Sub Zero refrigerator, or an article in Gourmet/Bon Appetit magazine. To achieve either of these goals will set white people at ease. But note well, that the sports section will always remain perfectly creased and unread, unless they have a teenage son. So on Monday morning, if you need to impress your coworkers, choose to talk about something you read in the Book Review section, the magazine, or Sunday Style. All white people are expected to do this. You are given an exemption during your early college years, but by age 22 it is pretty much law. Fusion restaurants offer a mix of all Asian foods (except Indian, but most don’t know that India is part of Asia) in an atmosphere that resembles a cocktail lounge in the West Village as opposed to Hong Kong. Basically you can eat exotic, in comfortable surroundings. Many are not shy to admit that the food is subpar and overpriced, but they still line up for hours to get in because they love the decor and the mix drinks. These places often have names with no Asian words or characters in them and are limited to two syllables. ie) Ginger, Spring Rolls, Wild Rice, Sumile. Sometimes the names are really clever like “Asiate”, get it? Summer: Who was that? It sounded like a girl. Seth: Did it? Yeah. Well, sure. Because I’m listening to the radio. And This American Life is on. And so there’s a girl talking. Summer: Is that that show where those hipster know-it-alls talk about how fascinating ordinary people are? God. Leave it to a show about stereotypical white people, to actually explain how real white people act. The quote above is from the television show “The O.C.” and the character of Summer is making reference to the Public Radio show “This American Life”. White people have an uncanny ability to make the ordinary exciting and there is no better forum than public radio to best showcase this. White people love stations like NPR (which is equivalent to listening to cardboard), and they love shows like This American Life and Democracy Now. This confuses immigrants from the third world. The see the need for radio as a source for sports, top 40 radio and traffic reports but they don’t quite understand why people who can afford TVs and have access to Youtube, would spend hours listening to the opinions of overeducated arts majors. To explain this love for Public Radio, one only needs to summarize several previous posts on this website. Let’s use my friend Craig as an example. Craig has a high paying 9 to 5 so he feels guilty about all the problems in the world. To make himself feel better he likes being socially aware of things Post #18. However he spends most of his time indulging in the arts and going out for dinner so he has little time to devote to this. He found solace in The Daily Show Post#35, however he decided that life would be better if he did not have a TV post #28. Craig found an adequate replacement in Public Radio. Now if you truly want to understand White People I recommend listening to Episode 328 of This American Life, entitled “What I Learned from Television”. The episode was recorded in front of a live audience, and what is important here is not the content of the episode but rather the reaction from the audience. Listen to times when they laugh and when there is applause. Confusing? Yes it is! But we’re all here to figure out White People and somehow Public Radio has the answer. While white people certainly love “the cinema,” they are required to balance their interest in film with an interest in live theater, most notably plays. In spite of plays having minimal sets, no special effects, an intermission, and a higher admission price, white people believe that live theater is essential to any cultured city. It is not known if white people actually enjoy plays or if they are just victims of massive peer pressure from the 45% of white people who have acted in a play at some point in their life. The only real advice around this subject is to never accept an invitation from a white person to go see a play. Often times you will be supporting their friend or cousin and then get stuck with a $45 ticket (at least) and three hours of trying to figure how close you are to the end. But there are different levels of white person Sushi love. At the bottom are the spicy tuna/california roll eaters. These are the people who get their fix at places named “Rock And Roll!” “Magic Sushi Company,” or Trader Joes-type supermarkets. 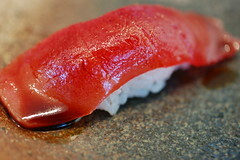 Often times, this sushi isn’t the most authentic, but white people can’t get enough! The next level up is the entry level Sushi snob, these are people who still love rolls, but are willing to branch out to Salmon and Tuna sashimi, maybe even eel. Finally, you have the white sushi snob. These people just take it all way too far. Often times, they will only sit at the sushi bar, will try to order in Japanese and will only order Omakase. These people will often be extremely critical of anyone who eats a roll of any type or does not properly flip the nighiri into their mouths. When white people get Sushi they all want to order Sake to complete the authentic experience. So, how can this information be turned into personal gain? White people are obsessed with finding good sushi, therefore if you offer to take them to ‘the best sushi place’ in town, you are sure to have them accept. If you are asian man, this is an almost no-fail method of getting dates with white girls, and maybe, just maybe joining Bruce Lee and Paul Kariya’s dad. In addition, going out for Sushi is considered a special evening in white person culture. Not as special as breakfast, but still, it comes with expectations. But what if the person you are interested in is a vegetarian? Not a problem. For some reason, most white people who say they are vegetarians will eat Sushi. Apparently, fish aren’t cute enough to warrant inclusion with pigs, chickens and cows. If you want to understand white people, you need to understand indie music. As mentioned before, white people hate anything that’s “mainstream” and are desperate to find things that are more genuine, unique, and reflective of their experiences. Fortunately, they have independent music. Indie music also produces a lot of concerts, for which white people can attend and meet other white people. It’s especially useful, since they are attending the same concert, they both like the artist and can easily strike up a conversation that will flow from band at the show->other bands they like->where they went to/go to school->where to get the best vegan food in town->agreement to meet at said restaurant for awkward date. If you mention a band you like and the other person has heard of them, you lose. They own you. It is essential that you like the most obscure music possible. *-do not substitute Stereogum for Pitchfork, as this is one of those things that used to be cool, but is now not cool. It is surprising that it took all the way to #40 to call out Apple products. Initially, we were planning for an entire week on Apple products, but that would just be over kill. Plain and simple, white people don’t just like Apple, they love and need Apple to operate. Simple answer: Apple products tell the world you are creative and unique. They are an exclusive product line only used by every white college student, designer, writer, English teacher, and hipster on the planet. You see, a long time ago Apple’s were super popular among layout artists and graphic designers. Then Apple released Final Cut Pro and became the standard for film editors. As a result, lots of creative industries used Apple computers instead of PCs. Eventually, people started making the connection, and all of a sudden all white people need to have a Mac. It is also important that white people are reminded of their creativity, and remember you need a Mac to creatively check email, creatively check websites, and creatively watch DVDs on planes. White people also need iPods, iPhones, Apple TV, AirPort Express stations, and anything else that Apple will produce. Because you need to express your uniqueness by purchasing everything that a publicly traded company produces. Knowledge of Apple products can be useful in a number of social situations. If you see a white person with a Mac, an easy way to approach them is to say “Is that a Powerbook? What OS do you have?” They will happily start talking to you, after the requisite five minutes, you can invite them to an 80s night.